Brussels sprouts, resembling tiny, tightly closed cabbage heads are members of the cabbage family and were first cultivated in Belgium, and hence the name. They are an excellent source of vitamin C and a good source of folate, potassium and vitamin K. They have the same cancer-inhibiting potential as cabbage and broccoli. While buying brussels sprouts look for ones that are compact, bright green and firm to touch. They should not have yellow or wilted leaves. They don't take long to cook and can be steamed, sautéed, microwaved or boiled. In spite of all these benefits, most people are apprehensive about them. It is because they have a slight bitterness and it is what I like about ‘em. 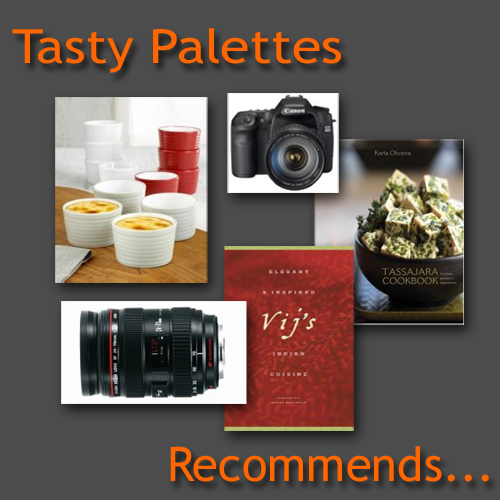 If properly cooked and flavoured with right spices, they are delicately nutty. In this recipe, the acidity from tomatoes and sweetness from the bell pepper compensate for the bitterness, while creamy cashews take them to the next level. The spices used in this recipe are minimal, not overpowering the delicate flavour of brussels sprouts. Cut the stalks of brussels sprouts and peel off outer leaves that are damaged. Wash and halve them. Some leaves will fall off, reserve them too for cooking. Lightly toast the cashew nuts in a pan until golden brown. You can also roast the nuts in a 375F oven for 5 minutes, turning them once. Be careful not to burn them. In a pan, heat oil on medium heat and splutter mustard seeds. Then add cumin seeds and asafoetida and roast them for few seconds. Remove pan from the heat for a minute and add chilli powder, turmeric and salt. Stir them for a minute, return the pan to heat and add tomatoes and brussels sprouts. Cover and cook, taking care not to break the brussels sprouts halves. Sprinkle water if necessary. When they are half done, add red bell pepper. Cover and cook for 5 more minutes or until brussels sprouts become soft and bell pepper retain their crunch. Remove from heat. Season with black pepper, if desired. Just before serving, stir cashew pieces and cilantro into the curry. Serve warm with rotis or rice. I love how you're trying to make this a friendly veggie, Suganya! hey shall i tell you something, i never cook this veggie except for christmas lunch.But yours look amazingly delicious!! I love Brussels sprouts...one of my favorites..! you asked about the onion/garlic powder in the Madras noodles....since they are mixed in with the other spices, its not so bad. I made the noodles because I had to get rid of the powders... (hehe). Love the look of your brussels sprouts curry, Suganya! I buy brussels sprouts often, but usually end up using them for a quick poriyal. Love the bright beautiful photo. I loved this presentation and it's quite tempting.I too passby them in grocery stores.this time i won't.thank u for this.and ur pics r so tempting. Hi Suganya! brussel sprouts recipe looks great and yummy. Even I didn't tried till now. I want to try now. Thanks for sharing. Nice recipe! I usally cook it with sesame and musturd seeds. Looks good! 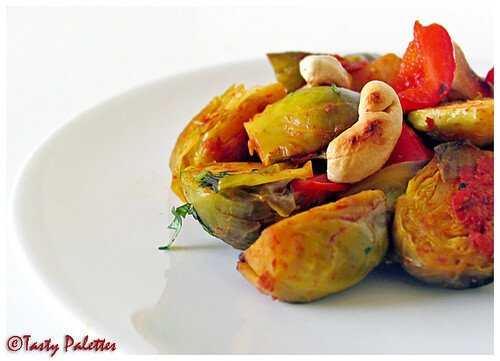 and Brussels sprouts adapt to Indian cooking rather well. That looks like a simple yet elegant stir-fry. I've always made a stir fry with these brussels sprouts combined with sliced onions. I think cashew nuts would add a wonderful texture and a nutty flavor. I'll surely give this a shot! Thanks for sharing! And the pics are too good to resist! we lvoe this veggie. waiting for ours to mature in the garden. nice recipe. 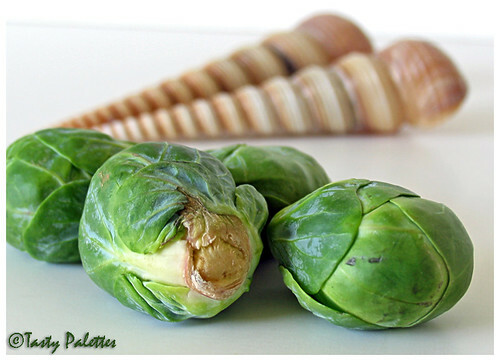 Never heard of Brussels sprouts till i saw this... looks different! Am quite surprised that so many of you haven't tried Brussels sprouts yet. Do try 'em when you can find them. I will try posting few other recipes with those sprouts too. Ooooh I love this saute'. Brussel sprouts are really great cooked this way. I never tried cooking with brussels Sprouts till now, will surely have to try after reading your very neatly explained recipe. Also would love to know more recipes using this veggie. And nevertheless to mention your pictures, I need to take few tricks from you! hey that is a nice one. esp. with cashews. I just simply saute them. I somehow got aversion to the brussel sprout from the beginning,but now on seeing!!! ur recipe,i feel like trying it immediately.